Add rigidity to your car’s chassis by purchasing high-quality suspension bars and braces here at Carnoisseur. 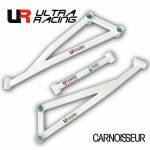 Find strengthening bars and braces from the likes of Ultra Racing, which will make your ride tighter and ready for fast-road or track use. Hoping to enhance your car’s suspension system further? We have anti-roll bar kits, coilover kits, shock absorbers and springs all ready for you to take home today. Browse now and order your suspension bars and braces online without delay. You can also visit an Outlet near you and complete your purchase in-store.